If serenity, security, splendour and space are part of your cares, then, you are welcome to The Fairmont – a perfect place with you in mind. Take advantage of our SPECIAL OFFER with a whopping 5% DISCOUNT OFF. 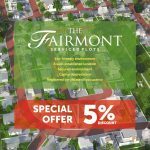 Fairmont is a carefully planned private community with lush green gardens, extensive walkways and modern infrastructure. Nestled in the quiet and serene environment within the Citiview Estate, with a beautiful landscape and layout that seeks to preserve nature’s gift. Citiview Estate Arepo is located less than 10 minutes away from Central business District, Alausa. High capital appreciation, minimum of 42% by year i.e. 30% instant appreciation based on discount and at least 12% by year end upon completion of expansion of Lagos-Ibadan Expressway (Lagos State) which is scheduled to be completed this year.